Roaring Toyz Is excited to announce our new 30″ Inch Wrap Style Bagger Front Fender! Cover up that huge 30″ tire with this American Made 30″ Wrap Bagger Front Fender. This fender is for Harley Davidson Touring Models with a 30″ front wheel conversion and will require custom spacers with the correct width to bolt direct to your fork legs. Constructed from biaxial hand laid fiberglass for strength and durability. No need to cut down welds and rework like steel fenders. This fender is prepped and ready to paint with a supreme finish. You and your painter will love the finish on this custom molded front fender. Purchase this fender direct on our website HERE! This fender is made to fit all Harley Davidson Touring Models [ Streetglide, Roadglide, Road King, Electraglide Ultra Classic] and all custom motorcycles with a 30 Inch wheel. This 2012 Kawasaki Ninja ZX-10R built by Roaring Toyz proves that you don’t need a flashy paint job to show off. When owner Brody Gentz brought this bike to us, it still had its stock black paint. Brody wanted it to match his Toyota Tundra, so we painted it a special Toyota super white, making sure the bodywork, windscreen, bar ends and handlebar switch housings all got covered. The understated paint job makes the custom Roaring Toyz touches stand out even more. The rear end has six inches of stretch with the Roaring Toyz +6 Over Billet 240 Single Sided Wide Tire Swingarm Kit. Since the ZX10’s frame is flat anodized black, we also anodized the swingarm, swingarm linkage and heel guards to match. All of that flat black anodizing is a stark contrast to the Performance Machine chrome-plated Shock wheels with a center wheel design. We even customized the wheels, adding contrast powder coating in the same Toyota White that graces the bodywork. The 120/70/17 front tire and 240 XXL rear tire are both Pirelli Diablos. There are a lot of Roaring Toyz custom sportbike additions to this Kawi, including a Roaring Toyz billet fully adjustable lowering link, custom stainless steel braided brake lines with black ends, black anodized billet license plate bracket, swingarm caps, yoke stem cap and frame plug set. The new custom sportbike stereo system by Roaring Toyz gives this ZX10R two 2.5-inch speakers in the front upper fairing and two more custom-mounted in the seat pad on the rear seat cowl. The speakers might be hidden, but you can’t miss the sound blasting through a Bluetooth setup with a 50-watt amp pushing the four speakers. To top it all off, a multi-color, multi-function high intensity LED light system with a remote ensures you don’t miss this bike after dark. Lowering the suspension on your Honda 500 just became easy with this new fully adjustable rear lowering link from Roaring Toyz. This link will allow you to adjust rear ride height from stock to as low as you want to go. CNC machined from 6061 T6 Billet Aluminum these links are adjusted with a large steel tie rod style turnbuckle locked up by two large jam nuts and an extra set screw for safety. We have machined windows with max. length indicators to prevent extending the link too far during installation. The best part of these links is we install O.E.M. style needle bearings with dual seals in each side. This allows the link to operate smoothly and correctly with no binding or squeals like other aftermarket links. CNC Machined in the U.S.A. When Alex Hernandez called us to customize his 2013 Raven Edition Yamaha R1, he already knew what he wanted. Alex had done his homework on swingarms and realized our Roaring Toyz Billet 240 Single Sided Swingarm Kit was exactly what he was looking for. Alex wanted a custom build that would look great and get attention while still retaining function. Alex knew our kit was the perfect fit since it has been put to the test time and again: our swingarms have been tested on roadrace bikes, drag bikes and the bikes used by Team Icon stunt riders Nick Apex and Ernie Vigil, which were featured in the Drift 2 video. Alex went with a +4 over extended swingarm, pairing it with Performance Machine Torque Platinum Finish forged aluminum wheels wrapped in Pirelli Diablo tires—a 120/70/17 front and XXL 240 rear. A Roaring Toyz Billet Lowering Link was used to level out the suspension in the rear so the bike will look and ride balanced when Alex is tearing up the streets of Miami. Our Roaring Toyz 240 Single Sided Swingarm Kit is available for Yamaha YZF R1 Models from 2009, 2010, 2011, 2012 and 2013 in lengths from +2 to +12 over stock in Black Anodized Or Chrome Finish. If you ride a 2011-2013 Kawasaki Ninja ZX10R, then now’s your chance to dress it up with a Roaring Toyz 300 or 330 OSD Swingarm Conversion Kit. This exclusive wide tire kit just debuted for the Kawasaki ZX10, and it allows you to add a 300 or 330 rear wheel and tire using only one chain. More power to the ground: One chain conserves power and delivers it to the rear tire. Fewer parts to break: There are no jackshafts to fail, and a single chain will last longer than two chains, which cause excessive chain and sprocket wear. Better throttle response: When you get on and off the throttle, response time is quicker because there’s one less chain involved in the process. Better handling: A jackshaft causes a push/pull effect, which makes steering tricky. A single chain means your bike handles more like a stock ride. Easier maintenance: Caring for the chain on your OSD Swingarm is just as easy as caring for the chain on a stock bike, unlike complicated jackshaft-driven conversion kits. Shorter wheelbase: Going bigger doesn’t have to mean going longer. Unlike jackshaft swingarms, which start at 8 inches over stock, the Roaring Toyz OSD Swingarm Kit has a wheelbase from stock length to 12 inches over. As if you needed more incentive to put the Roaring Toyz 300 or 330 OSD Swingarm Conversion Kit on your 2011, 2012 or 2013 Kawasaki ZX-10R, you can ride proud knowing that it was designed and manufactured in the USA. 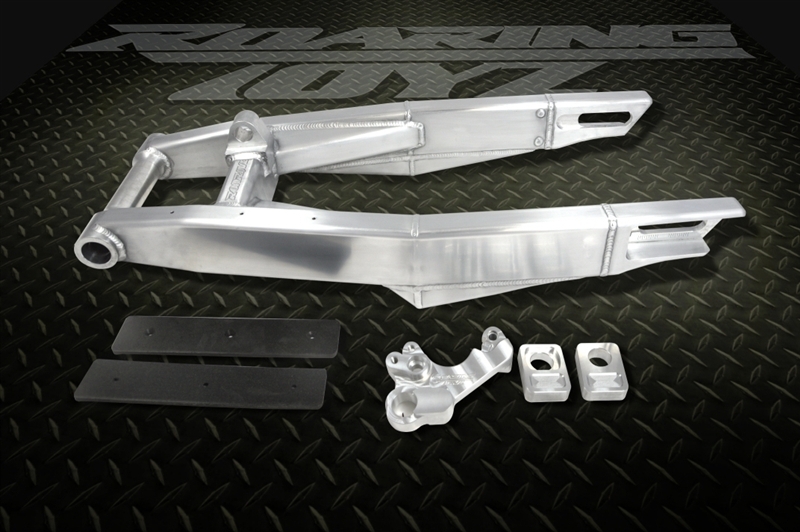 The OSD Swingarm kit is made in-house at Roaring Toyz with precision craftsmanship and top-quality materials. All of the Roaring Toyz OSD Swingarm Conversion Kits come standard with our trick stealth underbracing or tubular underbracing, as well as hidden axle cover plates. You get your choice of black powdercoat, chrome-plated, or raw finishes. Every lever is CNC machined from 6061 billet aluminum and either black anodized, black anodized and contrast cut or high quality triple chrome plated. Roaring Toyz believes in precision engineering, and these billet levers fit perfectly to the stock clutch and brake perch for smooth action. Their shape is designed to fit your fingers so you’re comfortable even on long rides. Available for 2008, 2009, 2010, 2011, 2012 and 2013 models these levers are available in 3 different finishes with the chrome plated finish having a lifetime warranty! Buy the new Roaring Toyz custom billet levers for Harley-Davidsons as a set or separately, and ride easy. Roaring Toyz produces the best bolt-on swingarm extensions available: the result of quality engineering, top materials and a lot of testing. Safety is every bit as important to Roaring Toyz as style, which is why we’re actually NOT producing a bolt-on swingarm extension for the 2011-2013 Kawasaki ZX10R. Here’s the problem: the swingarm slot on this motorcycle is small. That means we can’t use as much material on the extension as we like. Given the power this motorcycle produces, we just don’t feel that’s a safe combination. Roaring Toyz is absolutely committed to safety and impeccable engineering, and we are not willing to risk a customer’s life by producing an extension of lesser materials and strength that can’t hold up to the horsepower. But we know you want stretch, especially if you’re heading for the drag strip, so we recommend the Roaring Toyz custom aluminum extended swingarm designed for the ’11-13 ZX10R. 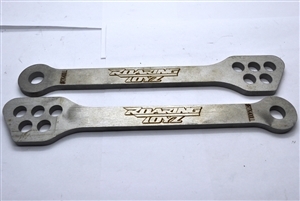 When you order your ZX10R swingarm, Roaring Toyz will custom make it for you. You get your choice of three finishes — raw aluminum, black powder coated or triple chrome plated. You also have your choice of underbracing – stealth bracing originally designed and engineered by Roaring Toyz or tubular. You also get to choose your extension length, ranging from 4 to 20 inches over stock. Don’t forget – your Roaring Toyz custom aluminum extended swingarm will take a little longer to arrive because it is NOT mas produced. It’s custom made just for your motorcycle and Roaring Toyz believes the quality is worth the wait. This is the only extended swingarm that Jason Britton trusts for his ZX10R drift bike and the arm used by Nick Apex of Team Empire on the motorcycle used in Icon’s now infamous “Motorcycle vs. Car Drift Battle”. Whether you are looking for better it’s on the drag strip or just that cool custom look, Roaring Toyz will ensure you ride stretched – safely. When it comes to customizing Kawasaki, the best name in the business is Roaring Toyz. Custom builder Robert Fisher has often worked closely with Kawasaki to develop aftermarket accessories, and he is doing it again with the latest models hitting the market. Whether it’s swingarm extensions, lowering links, low-exit exhausts or other custom touches that you need for your Kawasaki, Roaring Toyz has got you covered. Whether you just want a long profile or better ETs for your 2013 Kawasaki Ninja ZX-6R, Roaring Toyz has you covered. Our new bolt-on swingarm extensions give you five choices of extension, ranging from 2 to 7 inches over stock. We produce the strongest, safest stretched swingarms in the industry, so it’s no surprise that these are the same swingarm extensions used by the Rickey Gadson Drag Racing School. Each extension is constructed of CNC-machined 6061 billet aluminum and black anodized. A contrast-cut Roaring Toyz logo lets everyone know who you’re loyal to. No, it’s not some crazy new diet. 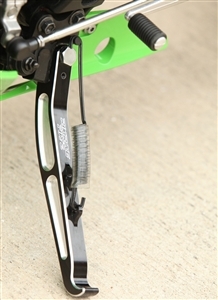 Roaring Toyz now has lowering links and a lowering kickstand for the 2013 Kawasaki Ninja ZX-6R. The lowering links offer five adjustment holes so you get your choice of ride height, and the lowering kickstand has all the hardware you need for installation and integration with the safety switch and springs. Make sure you pick up a lowering kickstand for your 2013 ZX-6R, too, so your bike is still stable when it’s at rest. All of the parts are CNC-machined from 6061 billet aluminum, black anodized, and contrast cut with the Roaring Toyz logo. There’s a lot to love about our low exit megaphone exhaust slip on for the 2013 Kawasaki Ninja ZX-6R. This polished stainless steel piece gives you a great look, reduces weight and makes incredible horsepower. Bolt on and go, whether you ride a stocker or have a wide tire kit. Don’t worry: the Roaring Toyz megaphone exhaust will fit any custom 2013 ZX-6R. Tunable baffles let YOU decided how much loud you can handle. When Kawasaki redesigned the Ninja 250 to make it look like a proper sportbike, we knew they were onto something. Anyone who has ridden one knows it, too: great things come in small packages. 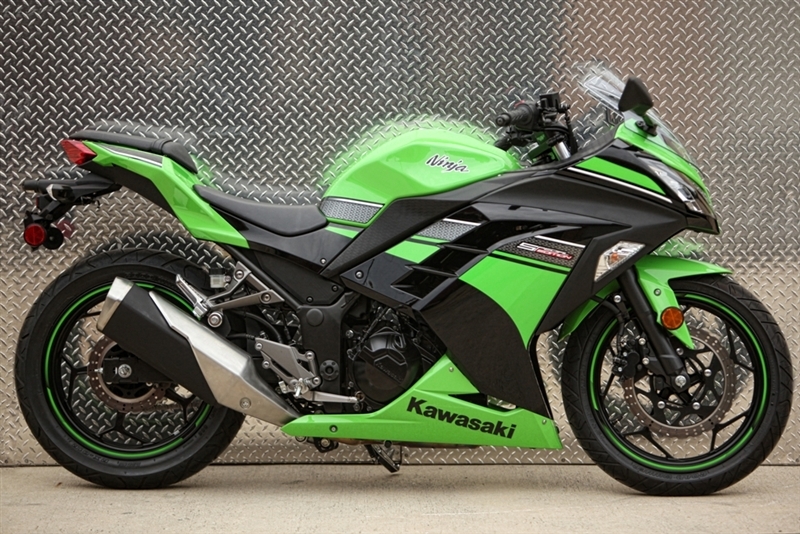 Now, with the 2013 Kawasaki Ninja EX300, the guys in green have done it again. We know that you’re going to want to customize the new lightweight Ninja, so Roaring Toyz has a new Ninja 300 lowering package kit: lowering links, a lowering kickstand, and 1” handlebar risers/front end lowering blocks. Each piece is CNC-machined from 6061 billet aluminum, anodized black, and contrast cut with the Roaring Toyz logo. The lowering links have five holes so you can adjust ride height, and the lowering kickstand comes with all of the hardware you need for easy installation. The handlebar risers and front end lowering blocks let you lower the front end of the EX300 by a full inch while still retaining complete suspension travel and proper clearance between the front fender and the upper fairing. Sure, you can get each piece separately, but the Roaring Toyz Ninja 300 lowering package kit has everything you need for a lowered custom look. Easy installation means you’re that much closer to showing up all those big-bore boys. SARASOTA, Fla.—Go high or go home. That was the attitude Roaring Toyz boss Robert Fisher had when he created 13-inch ape hanger handlebars for the Kawasaki Vulcan Vaquero 1700. The new Roaring Toyz ape hangers are the ultimate modification for the 2011-2012 Kawasaki Vulcan Vaquero 1700. Powdercoated black for a mean custom look, the ape hangers bolt directly to the factory risers for easy installation. A gentle bend offers a comfortable riding position as well as plenty of clearance between the bars and the factory inner fairing. Openings on the bottom of the new Roaring Toyz ape hanger handlebars allow the switch housing wires to run through the interior, creating clean lines and no obstructed views of those black beauties. Each set of bars is sold as a kit that includes stainless steel extended clutch and brake lines to accommodate the new handlebar length. The only other modification required to fit the new ape hangers is extended switch housing wires. The kits retail for $599.99. Get your Kawasaki Vulcan Vaquero a little higher with the new Roaring Toyz 13-inch ape hangers. Order online at www.RoaringToyz.com or call (941) 953-4423.